Gísli is named after one of the Saga’s most tragic heroes, Gísli Súrsson, whose father Þorbjörn was called Súr (Sour) after surviving a fire by climbing into a barrel of fermented milk. After killing one of his brothers-in-law to avenge another brother-in-law, Gísli was outlawed and forced to stay on the run for thirteen years before he was killed after being found hiding in the Westfjords. 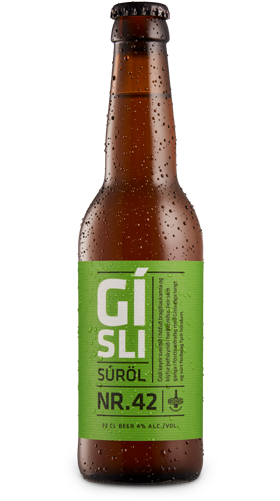 Gísli is a robust sour ale with notes of citrus, whey and silage. Ingredients: Water, malted barley, malted wheat, hops, Brettanomyces and Lactobacillus.